the good african story has arrived – read it, learn it, live it! In other countries, a public lecture by Andrew Rugasira could attract attendance fees as high as, if not justifiably more than, a Babyface concert in Uganda. Most Ugandans will not understand or appreciate Andrew Rugasira. At one point, he was one of our ‘tycoons’ both in the sense that we use the word to mean anyone with a flashy car and the ability to buy many drinks in a nightclub, and in the sense that he had successful entrepreneurial ventures. We hahad him (*this term is Ugandan pidgin and means something like, “held him in awe and reverence” and at the same time, “couldn’t believe he actually did this”) when he organised Lucky Dube concerts and filled up Namboole. First of all, he was talking to Lucky Dube himself – not just the Congolese musicians we had become used to under the promoter reign of the Tamukati Ndongolas. Secondly, he actually filled up the biggest stadium we knew possible – the whole of Namboole! Eventually, we heard that Andrew was even running airline excursions into the Congo on behalf of the government and doing God-knows what other businesses. We knew he was rich and going to get richer. But there was always a thread of consistency to the man, that is revealed as you read through his book, and that came to the fore on Thursday night. 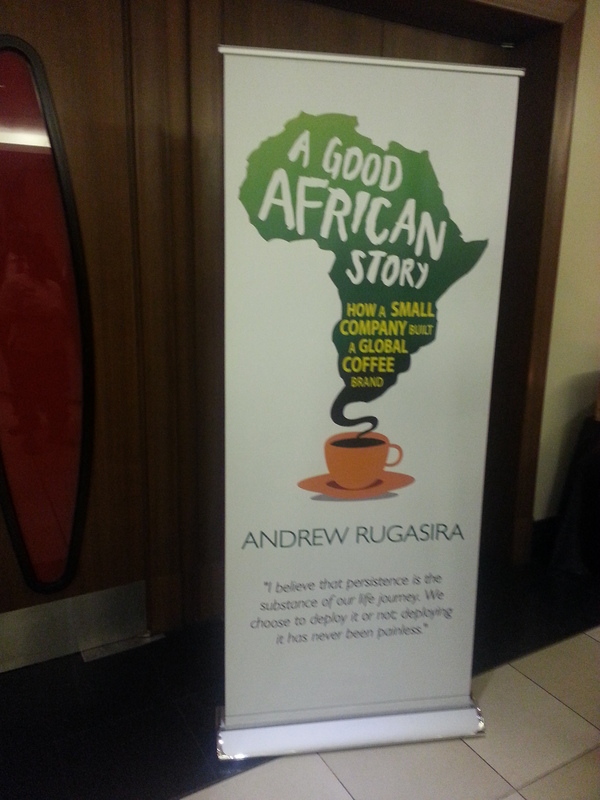 The story of Good African Coffee and Andrew Rugasira is only mid-way but it is already in writing – which is GREAT! I am happy that we can refer to this rather than, or alongside, the likes of Jim Collins (Built To Last, Good to Great) because this presents situations that we can relate directly to. “We need to move away from a culture of celebrating the arrival of someone and their wealth, and instead mentor the youth…,” he told us Thursday. I remembered how photos of his turquoise E-class Mercedes Benz ran in the newspapers when he’d just bought it (he offered me the car to use as part of my wedding convoy – which totally threw me!) and compared that to his current vehicle, which has been on the road for a really long, long time (Ugandan standards) and was just in front of me as I drove into the Sheraton Hotel for the book launch. I also chuckled to myself at the number of people who made comments about his ‘not buying a new car’ and how it was evidence that he was doing badly at some point. But therein lay some features of his story that Ugandans must learn from: 1. There will be bad times, but stay focussed and persevere right through them so that you can get to the good times 2. Don’t spend too much time or money on luxury material possessions now – all that should come much, much later 3. Ignore the lugambo (*Ugandan pidgin = rumours, loose talk, slander) because it doesn’t mean anything. Andrew mastered this last lesson, and stuck to his mission in spite of lots of useless idle talk by people who were honestly on the far periphery of an achievement that is being lauded globally 4. Learn loyalty and pay loyalty with loyalty – to get this you had to be in the room, watch him with his people, and read the book. The last person I said bye to as I left was Alex, his driver, an old man who was driver to Henry Rugasira, and drove the child Andrew Rugasira to school back in the seventies. At the book launch, we were treated again to Andrew’s strict attention to detail, presentation, image and excellence as we walked in and got served coffee, tea, juice and really tasty bites. 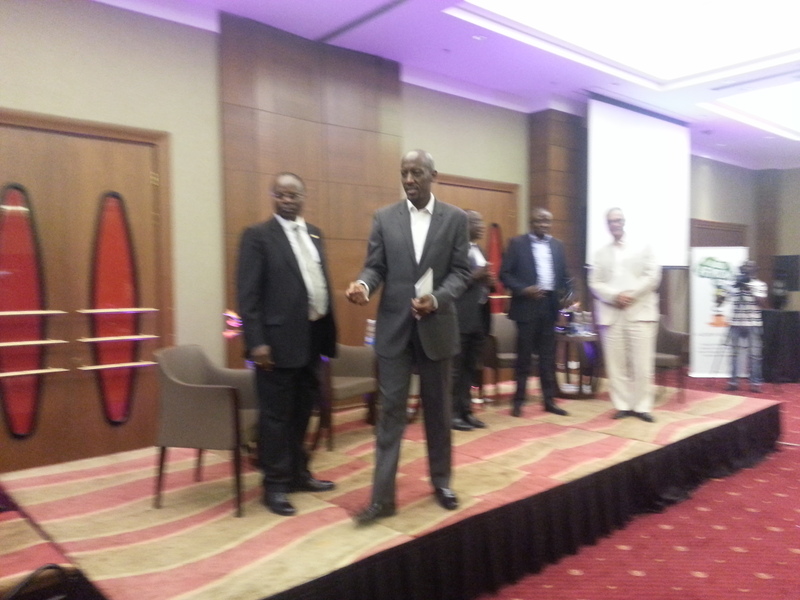 More importantly, his intellectual self came to the fore during the discussion led by the brainy panel of Mahmoud Mamdani, Samuel Sejjaaka, Dr. Louis Kasekende, all moderated by William Kalema. The discussants disposed of the book well and elicited viewpoints that might have been missed by an ordinary casual reader, and some of the views ignited fires in the plenary – Dr. Kasekende’s assertions about the government’s role in growing business, Prof. Sejjaaka’s statements about the politics not being right and the need to take off our colonial spectacles, and Prof. Mamdani’s fear that Andrew represented an entrepreneurial generation that felt entitled to government support. “You expect public servants who have never even managed a kiosk to make meaningful economic decisions?” he posited. We laughed, though my view is that the problem with our public servants is that many of them are actually running only small kiosks in their private lives and use those little experiences to run entire sectors of the economy. Their kiosks don’t even have names in many instances, so they can’t appreciate the power of branding; are not bothered with market access because they are mostly neighbourhood enterprises whose main customer is the civil servant’s family and relatives; access to capital is the petty cash voucher book; and human resourcing is the spouse’s village. Their expectations are low because they are quite content to operate the way they do, subsidising mediocre lives with a couple of million shillings use to buy second hand cars or diversify into boda-boda as a ‘business’. Then, enter an entrepreneur a la Andrew Rugasira talking about packaging coffee to rival, nay, beat Nestle and hopes of selling it on supermarket shelves in London, Philadelphia and Cape Town and asking for government support. The discussion can’t go very far. Which is why, I argued, Andrew’s call for more entrepreneurial mentorship should be heeded. His book is a manifesto for this the government to provide mentorship to enterprises such as Good African Coffee – and when we find Good African Coffees with Andrew Rugasira’s, we should put them into positions of public management so that a multiplier effect is achieved quickly and effectively! Back to Prof. Mamdani’s argument, quite critical as it was, many didn’t agree with it in entirety – which is a healthy part of intellectualism. You provoke thought and allow the opposing view to emerge. Governments, Mamdani argued, should not engage in business or the promotion of individual businesses because the line between that support and corruption is very thin. They should instead seek to promote entire sectors and entrepreneurial segments or classes. This generated lots of debate, and a heated response from Andrew himself that made me think of that Kung Fu movie scene where the student takes on the Master and ends the fight with his foot on the old man’s chest. “The US economy built itself on protecting its infant industries, Britain, Holland, Germany all did the same,” Andrew argued. “After the first and second World Wars, it stopped being fashionable. Those who had benefitted from protecting their infant industries came out and said actually it’s classical economics to allow the free market to operate. Markets are the most effective allocators of resources, so all of you others emerging and evolving should not have state interference. This came up right to the time that Professor Berg wrote the Berg Report which became the foundational framework for the Structural Adjustment Programmes,” he said. “What worked for one group of nations one generation or two before was not good for us. So today I say how can the EU spend 40% of its budget on agriculture? That 40% they spend contributes 2% of their GDP and employs 5% of their population – a structural distortion. When we argue against that and we say that needs to be reversed, it is not because we want to be entitled. It is to say something is fundamentally wrong with the structure of the global economy. As Africans we have had enough of accepting status quo as status quo. It is time to stand up and say something is wrong,” he went on. “Will we have the power to change it in this generation? Maybe not. But for one thing, my son is going to grow up knowing that something was wrong, he is going to argue against it and he is going to have the practice of his generation to address that and transform the generations that come after him. “We cannot take these distortions and structural imbalances for granted. These are the things that are keeping these economies down. When we stand up and say we need to change them it is not to say we need to change them so that we can benefit. “Enough already. I don’t buy that nonsense about capital not being there. You can steal US$100million then why not give capital to businesses?! It is easy for a bunch of crooks and nincompoops to steal US$100billion and we have whole sectors of entrepreneurs who have no capital?! There is a problem! The NSSF is sitting on billions and they can’t lend it because of rent-seeking? There will always be rent-seeking and there will always be corruption! The Thai, Taiwanese, Singaporean, Korean and Chinese experience shows it is not how many entrepreneurs you can support and how many are corrupt – it is how many good ones in the process can you build that they may employ people, create wealth, pay taxes and prosper your economy?!!!!!!!! I’ve gone for a pot of Good African Coffee. how did he meet their mother? why do i still care? Engrossed in a bout of insomnia, I heard Jon Stewart make mention of How I Met Your Mother and how long we’ve been following this never-ending tale when I realised that I am one of those who has been wondering exactly how he met their mother. Those who haven’t watched this sitcom have probably not suffered the type of insomnia that has been brought on by widespread internet access and its attendant evils – torrent downloads being a major one of them. Back to this guy killing his kids by way of a bedside story, does anyone know yet exactly how he met their mother? I stopped somewhere at Series Five or Fifteen and just drifted into something else like The Wire or Entourage. You see, by the time we began on this quest for how he met his mother, these TV Series’ were a little bit hard to come by. Back then, I used to buy box sets whenever I travelled – but mostly at the Dubai airport shops. That kept me disciplined enough in my viewing to finish Friends, Everybody Loves Raymond, Frasier, The Shield, and even CSI…eh – that’s when it started unravelling. First of all, CSI started splitting up like Amoeba and I am waiting for CSI: Wandeg’s to kick off; secondly, people started supplying movies on unmarked DVDs at prices we then thought were ridiculous, but because we didn’t ever imagine the day would come when we’d be able to buy entire seasons of sizzling hot (released this afternoon) sitcoms at the cost of half a packet of cigarettes. I cannot imagine being the owner of a video library today, even though I have been that broke before in life. And then there comes a gripping sitcom like this How I Met Your Mother to begin ruining the experience of sitcoms. Friends ran on and on and on and on and today we still watch re-runs because of what it did for us back then. It was called Friends and was about Friends the whole damn time. How I Met Your Mother is some sort of unrequested domestic accountability in somebody else’s home, and even though it was insanely entertaining, it is also irritating because we need to get to the bottom of this damn concept. Exactly how did you meet my mother? Or their mother? Because I think their (whoever they are – I’ve never been able to work out these details that should be important) mother is a bit irresponsible, leaving them to this cruel fate. This cruel fate being, in my opinion, Ted Moresby’s evil plan of keeping his kids out of teen trouble by locking them down to the sofa with a long-winded tale about how he met their mother. Many people must have taken time off after the Season One break to ask their fathers to tell them the story, in the hope that it would fill the time until Season Two broke but we all know how that probably went: a) (Slap) “Stupid. We don’t discuss such things! Msssschewwww!” b) (Slap) “Eh? Are you mad?” c) (Slap) “Eh? Are you drunk?” d) (Slap) (Slap) (Slap) (Kick) and so on and so forth. But the above options are much, much better than what Ted Moresby’s kids are going through on that sofa (aka couch). It’s been so long that I can’t remember properly, but I don’t think Ted Moresby’s kids asked him the question. He just showed up one day, sat them down, and then began telling them. The guy did it with such ease and casualness that their mother must have known this side of him – which makes me conclude that she is irresponsible because how can she go so long without even checking on them? Maybe, I realise, she herself has only just been released from a ten-year long spell of a story about how he left home after his university degree, and she has fled to catch up on a life gone by – try out this new music-listening device called a disc man, buy an apple to see if the taste has changed and work out why are so many people talking about the share price of a fruit, and so on and so forth. But exactly how, I ask again, did he meet her? The great escapades of the impossibly cool crew of Barney, Robin, Marshall and Lily have kept us laughing and envious in large measures for all these years but, dammit, who has watched the last episode of this unlikely saga? THE common threads linking the passing and farewell ceremonies of three men of national significance this year was their simplicity in life, their pan-Africanism and nationalism, and one that nobody has paid much attention to – the preclusion of wreaths at their burial ceremonies. We were told that James Mulwana specified it in his will or codicil, Amos Kaguta had made no secret of his dislike for the practice, and similarly, Eriya Kategaya did not encourage it. I applauded each time I heard there would be no laying of wreaths during the funeral services, because I am against the habit. I don’t know exactly when or how how we started doing this in Uganda but, being sensible like those three eminent gentlemen, I want it to end. I hadn’t seen or heard of it in other countries either but like the proverbial sheep, I have gone along with the practice and have even been “in charge of wreaths” at some points. At those points, I always approached the task with a mix of reason, logic and sentiment: in what order the wreaths should be laid, whose wreath should be what colour, what flowers to include in the different wreath arrangements, and at what time they should be made, delivered and watered. I have the number of an efficient florist on speed dial and I have even hired a van to transport wreaths more than 200 kilometres! They are useful, I must say, at the fresh grave site as they are used to cover the cement slab to allow it to set uninterrupted while giving your loved one a comfortable-looking resting place. But besides that I think they simply provide some people with a photo opportunity and the chance to hear their names said out over the loudspeakers. Don’t get me wrong – I certainly don’t like wreaths being laid in church and I won’t have it done at my funeral (Note: Cut this out and save it) but for other people it is soothing and provides a symbolic gesture to use in bidding loved ones farewell. When I first started thinking about it I thought the culture was derived from ancient days when scented flowers were probably spread over the dead to clear the smell of putrefaction. But it turns out that wreaths are more normally laid at graves in memory of the departed – and that sounds familiar. Some accounts have it that the practice of laying wreaths (not in church) goes back to Ancient Greece and represents the circle of eternal life, which is why funeral wreaths are shaped that way. At funerals of young maidens, one recount goes, a young woman of the same age as the one being mourned would lead the funeral procession carrying a wreath of white flowers to represent the purity of the deceased and the eternal crown of glory reserved for her in heaven. It was also important, they say, for the wreaths to be made of evergreens, representing eternity of life – which means that our wreaths made of roses that wither within a day are inappropriate in structure, as well as use. That’s why I won’t be in charge of wreaths at funeral services any more. More importantly, I won’t be having wreaths at my funeral. Instead, please plant flowers – preferably Ugandan varieties – around my gravesite and a few fruit trees to provide shade and nourishment for my annual visitors. Local fruits – ffenne, miyembe and how I wish there could be a jambula or two! Beautify my resting place, friends and family, but don’t use my casket for any glory. hats off to the media in Kenya! I greatly admire all media persons working and operating in Kenya for defying the so-called norms that would have had them covering the elections excitably without any regard for the potential repercussions arising out of the environment in which they operate. We’ve all talked about the bland coverage we’ve received these tense five days past, and the way it focused on simply reeling off election results without going into critical “what-if’s” and ‘projections’. Admirable! I couldn’t have asked for more – even when I complained a little that during the IEBC Press Conferences there were few or no questions at all. You see, we are used to seeing a frantic, almost rabid media at work covering elections on TV and online in the US, UK and other spots in the ‘free’ world. But the manner in which elections are covered over there in ‘developed’ countries fits their bill quite well. We should stop thinking that we must follow suit as proof that we are also ‘free’ and appearing to be ‘developed’. I have always argued that media professionals cannot operate the same way in all countries because we operate in different environments altogether, with different people, cultures and perspectives. The media in the United States, for example, can be as inflammatory as they want because members of the general public there would find it hard to organise themselves into death squads and go about decimating neighbourhoods with machetes and jerry cans of petrol. Their intelligence and crime prevention systems are good enough to make it hard for someone to import a container of machetes, and mobilise enough ignorant crazy people to queue up for one each before being pointed into the direction of equally ignorant, unarmed ‘enemies’. Not so for some of our countries, where too many people listen to the radio with the same fervent faith that the Israelites received Moses off the top of that mountain with the Ten Commandments. The invincibility of ‘the Big Man’ is brought about first by our being still too closely linked to our monarchical past, and is now perpetuated by the media that focuses mostly on the words and actions of ‘Big Men’. That’s why it was heroic for the Kenyan media to take the bold decision during these election results coverage to refuse ‘Big Men’ audience. Under normal circumstances, every and any statement of conjecture by a military officer, political leader or jittery candidate would have made headlines on the hour every hour. But not in Kenya. The local media in Kenya, apparently under a gentleman’s agreement – cited by the likes of The Independent – agreed to work for peace across Kenya in order to avoid a repeat of the 2007-8 violence. Now, I haven’t gone anywhere to do a Master’s Thesis or Doctorate in media studies in order to state how wrong or odd this might be from any paradigm, and I think that, for once, it’s a good thing not to have any of these biases. Using basic common sense as defined by me, the media played a society-maintenance role as paramount over the rote-defined information and analysis role. Obviously, he is one of those whose knowledge of things is stuck in a paradigm that will not accommodate the situation Kenya was in. The actions of the media in Kenya this week are much the same as the US media embedding itself with troops during the Iraq II war and ensuring that their coverage did not jeopardise the ‘war on terror’. I am all for media freedom within responsibility, and I applaud the Kenyan media for defining this for the world, much to the chagrin of many international observers. If they had been weaker in their love for compatriot and nation, some would have broken rank and delved into the troughs (not trenches) of sensationalism that would have jeopardised the war on terror that we suffered in 2007-8 right here at home. extend there. I am incapable of keeping time. My position on SIM registration up until Thursday evening was that the deadline should not be extended at all. Firstly because it sounds irritatingly as if someone is squeezing into a church or school pew, having come in late, and loudly whispering, “Extend there!” to those of us who came in early. Now that we have extended the date, supposing the very same people still don’t register? What then? A one-month extension? Followed by a three-week one? Till we are at five minute extensions? The matter even made it to Page One of the national newspapers proving that our failure to keep time is truly a national issue. The concept of ‘African time’ is now a reality with backing rather than sheer idiocy, until Ugandans who can keep time are in charge of our national affairs. We have had one year (three hundred and sixty five days) within which to register our damn SIM cards, fill out forms and have our photographs taken. Some people – we sensible ones, did so within that period of time – proving that about 14million SIM cards are officially in existence. I don’t even want to go into the reasons for the extension of the deadlines: Apparently the country would have collapsed into a silent heap if all the SIM cards were not registered; but if the immediate above were true, wouldn’t it stand to reason that people would register their damn phones?!!! Reasons aside, the concept of “the deadline” has been defeated in Uganda. Some sectors, such as schools and media houses, understand this concept better than others. In school, you must hand in your homework or coursework on time so that it is marked and factored into your performance appraisals at the end of term. Schools have time-tables they stick to both for teaching/instruction and administration. This is when the foundation of keeping time is supposedly built and I honestly thought they were doing a good job till this week. Media houses understand deadlines because if they don’t put a story in on time the news won’t be read at the top of the hour, or the newspaper won’t hit the street on time, therefore resulting in the news being stale. If this copy of Sunday Vision hit the street on Tuesday you wouldn’t buy it. Or, apparently, if you have one year within which to register your SIM card, very difficult for the people who own the estimated 10million SIM Cards that had not been registered by March 1, 2013. So what was the deadline for? What were the planned activities from March 1, 2013 going forward? And the ones after that? Are the security risks also being postponed? Will criminals also extend their evil plans for this time? I am angry at them, but my anger is not useful. I had two suggestions during the debate over to extend or not to extend: 1) Install an application on all phones of people who haven’t registered their SIM cards, so that every thirty minutes a muscular arm extends out of the phone handset and delivers a hard slap to the left or right hand side of the head of the phone owner or: 2) Compile a list of all the people who register their SIM cards during this extension period and publish it under the banner: “PROPONENTS OF AFRICAN TIME: THE PEOPLE WHO GIVE UGANDA A BAD NAME”. Option 1) above would be much more effective and beneficial to Uganda, but Option 2) is more feasible.